Due to high demand we are running a second workshop! 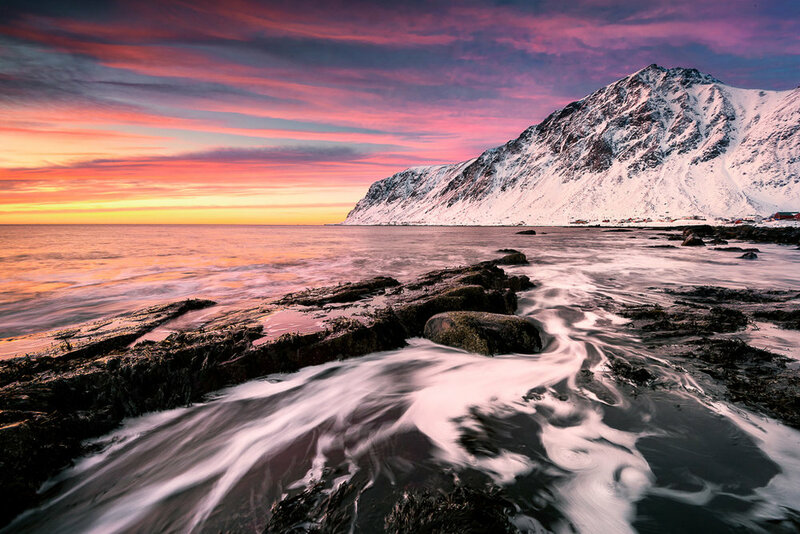 Develop your skills as a photographer, build a uniquely incredible portfolio, and immerse yourself in the breathtaking winter landscape or northern Norway. This ten-day photo tour in January 2020 is for amateur, aspiring and professional photographers alike, and promises to expose you to some of the world’s most spectacular scenery under ethereal lighting conditions. Your guides are not just expert landscape and aurora photographers; they are experts on this region of Norway too, and will be able to guide you to some of its best kept secret locations and little-known subjects, allowing you to take fascinating, unique images. At each destination, your photography guides will be on hand to ensure that you are making the most of the lighting and subjects available, so that you return home with incredible images you can be proud of. 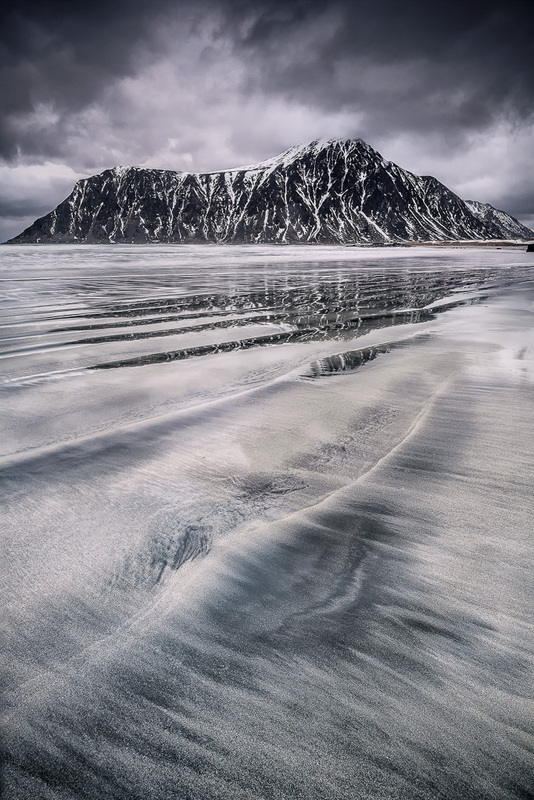 Post-processing is an important part of creating enviable photographs, so your guides will be able to lead you through post processing to ensure your Norway images are the best they can be. Making your own travel arrangements to Norway, on arrival into Leknes Airport you will be greeted by one of our friendly tour leaders and taken to your hotel. You will have the remainder of the afternoon to relax or explore the town at your own pace. At 7 pm, your guides and group will meet in the lobby of your hotel, before heading to a local restaurant for dinner. Here, you can learn your itinerary in more detail, get to know your fellow photographers and ask any questions you have about the next ten days ahead. As the Aurora is unpredictable, we need to take advantage of it when it's on display. So if it is present this evening we will head out and try to photograph the lights from a nearby location. Your accommodation in Leknes is for the full 10 days. After a decent rest, you’ll be up bright and early this morning for your first sunrise shoot in Norway. Instead of saving the best for last, we’re jumping right in with one of our favourite locations, because let’s face it, there are so many incredible locations to tick off in this region. At Flakstad Beach you’ll find the texture and detail in the sand and rocks makes for a unique shooting experience. Here we will split into two groups to shoot different locations; because there is so much to shoot in many places on this tour, we will be returning to some locations twice, for sunrise and sunset, to give you ample time to capture everything. The two groups will head to different areas for sunrise, then swap locations for the sunset shoot. Any night where there is a potential to see the aurora, we will be giving the option to head out and photograph, and seeing the location during the day will also aid you in finding a great composition for your aurora shots. Hamnoy and Reine are both classic Norwegian fishing towns, complete with quaint red cabins that stand out against the winter landscape. Today you’ll have plenty of time to explore the areas and find unique compositions that take in these towns and the surrounding mountains and fjords. Again we will spend all day in this area to make the most of it, and if there’s potential to see aurora, these villages offer a unique composition with the beautiful lights at night. After photographing each day, back at the hotel we will take time to take you through some post processing of your photographs. Whether sunrise, sunset, long exposure or aurora photographs, we will show you the key workflow and tips for selecting your best shots and enhancing them for social media and print. Today we head to Flakstadoya for sunrise, a breathtakingly beautiful inlet surrounded by fjords and jagged mountain peaks. As the tide rises and falls overnight, the sea ice drops and cracks over rocks beneath, causing so called ‘ice flowers’. These provide beautiful subjects to shoot with the massive peaks behind. Fredvien is a nearby town in the heart of the archipelago. This area is recognised for its huge bridges that criss-cross the water between islands, making for varied and interesting compositions. This is also where we can get a great shot of what the locals call ‘Gandalf’s Hat’ - an impressive tall, pointed mountain peak. This is another highlight shot that we will aim to capture if the aurora is visible tonight. Today we will head to another location for both sunrise and sunset, this time the stunning Haukland Beach. 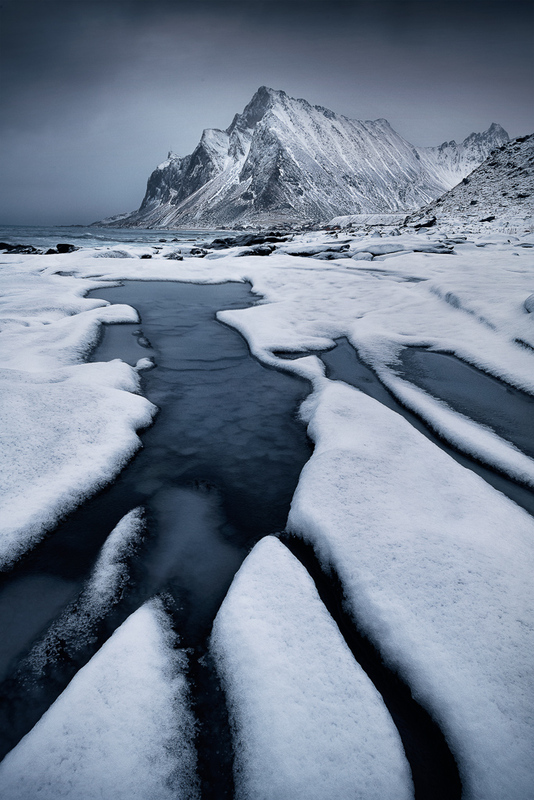 Surrounded by snowy peaks, and often with snow down on the beach, this location offers the ideal winter wonderland to photograph. Here we will be working on water movement and seascapes, and finding interesting compositions in the nearby rocky outcrops. Again, it’s ideal to shoot this location during twilight, so that if the aurora is visible, you’ll be familiar with the shoreline and compositions to photograph. Today’s location is absolutely beautiful, yet presents a great challenge to photographers. A tidal beach, it’s perfect for shooting long exposures to highlight the movement in the water, however there are also diverse compositions to be found in the nearby landscape. We want to make you familiar with this Uttakleiv and Haukland beaches as these are two main locations we will visit to photograph the Northern Lights. Knowing the shoreline and finding compositions during the day light means you’ll have a better chance at capturing a great aurora shot - it’s the difference between a good shot and a great shot. Today we will visit the absolutely stunning Napp Mountains, another fantastic location for photographing the aurora and also reverse sunsets. As the setting sun casts beautiful colours in the sky and onto the mountains in the distance, it provides an incredible backdrop to intricate rock formations or water movement in the foreground. Varied is on a rocky, isolated outcrop, which plays a big part in why it is so special to photograph. This area is really good for long exposures, both in the water, but also in the sky if it is a cloudy day, so we will focus on those shots here. In order to capture the beautiful snow-capped mountains and soft light of Norway in winter, we have to be prepared for some days where the weather is not on our side. This is partly why we visit some locations twice, for sunrise and sunset to ensure you capture the best colours and compositions possible. We have also given ourselves two extra days in case of poor weather. This gives us the opportunity to revisit any of the locations you would like to return to, or visit some other nearby locations, too. On your last evening, we will head to a local restaurant for your farewell dinner, where we will reflect on the different locations, experiences and new friendships we’ve made, before hopefully one last night of chasing the aurora! On your final day, you will be taken back to the airport by your guides where you’ll bid farewell. No doubt you’ll be heading home with an abundance of photographs and new techniques to continue on your photographic journey. The tour is always dependent on weather, as in the arctic weather can be highly unpredictable. When it comes to the Northern Lights, while they are most likely to be seen between September and April, there is no guarantee that they will appear at a given time. There is however always plenty to see and do if conditions do not favour any part of our original plan. A medium level of fitness is required for this trip, as we will be operating in the arctic circle we may experience snow, ice, wet weather and extremely windy conditions. As with all landscape photography we will spend a fair amount of time outdoors, Due to the extreme nature of the arctic we recommend winter clothing that is water proof and well insulated.